... Prelude to the Venus Transit 2004! The last ESO image taken by our active observers can now be seen via this page . Pictures of the ESO observers and some of their photos are available here . The load on the ESO website reached an all-time record of about 10,000 hits per minute! Many visitors therefore needed a little patience to see the images. During May 7, the ESO website experienced a total of about 3.5 million hits and about 50 Gigabytes of data, mostly images, were delivered . The great majority of these were from the "Mercury Transit" pages. You may check "Google News" for the latest media reports about the Mercury Transit. 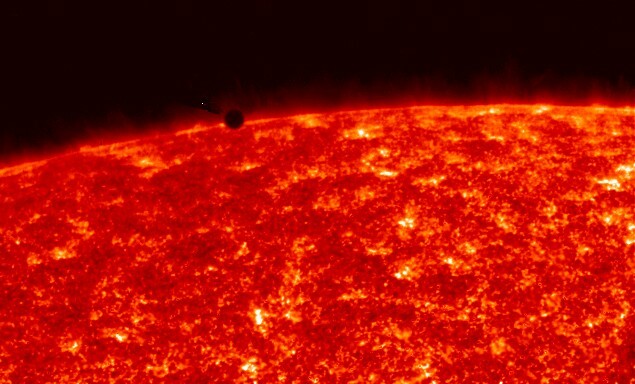 Mercury in front of the Sun as observed by the TRACE satellite in 1999. On May 7, 2003, the planet Mercury passed in front of the Sun as a small dark point. This is a kind of eclipse of the Sun - however, it is not caused by the Moon but by a planet. This kind of astronomical event is called a transit and it occurs approximately once every 7 years. This event was visible from Europe, Africa and Asia. 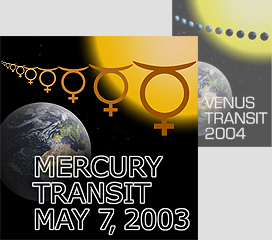 In fact, the transit of Mercury was a fine "prelude" to the even more fascinating and important celestial event next year on June 8, 2004, when the larger planet Venus will pass in front of the Sun - very easily observable from the same continents (read about the associated public education programme !). The information below was provided before the Mercury transit and reflects the situation at that time. The faint disk of Mercury on the disk of the Sun. 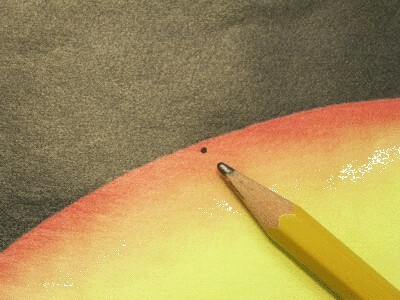 But the disk of Mercury is very small and is very difficult to see. A powerful telescope was needed to observe this event and to show clearly how Mercury moves across the solar disk. The disk of Mercury is only 13 arcseconds across (this corresponds to the size of a 1 EURO coin seen at a distance of about 370 metres), that is, much smaller than that of the Sun (about 1800 arcseconds). Note that such an observation of the Sun is dangerous without special protection. The only completely safe way is to project an image of the sun on a white surface (for instance, a piece of paper or cardboard). The next drawing shows how to do this. Note that the "shadow" cardboard should be as large as possible to obtain a better contrast of the solar image and features on the disk (Mercury and sunspots). If you use binoculars, you must cover one of the beams. To support your observing activities and to write down your observations, we provide here an "observation sheet" with a useful lay-out and space for the main data to be recorded. 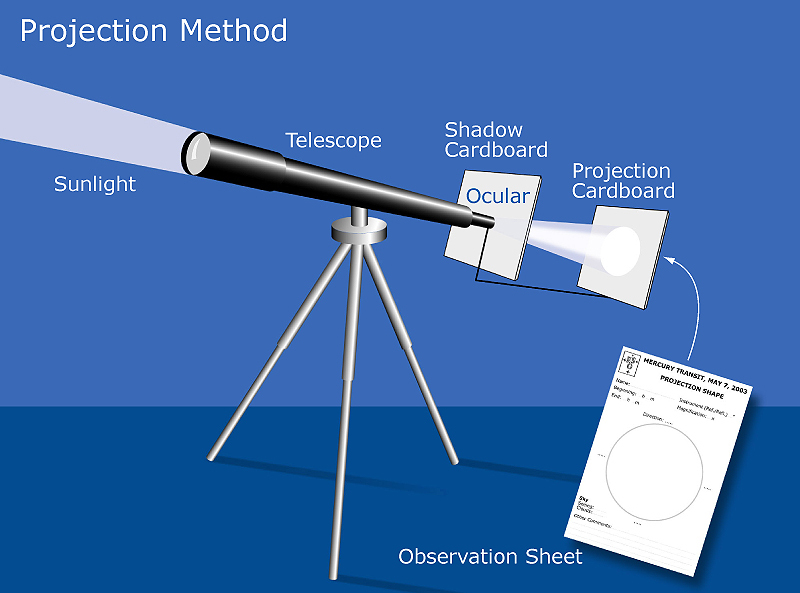 We suggest that you print it and mount it on a piece of cardboard at the appropriate distance behind your telescope's ocular so that the projected image of the Sun fits into the circle. You may then draw the position of Mercury at different times as it crosses the solar disk and also any sunspots you see. "Observation sheet" on which the image of the Sun may be projected, e.g. 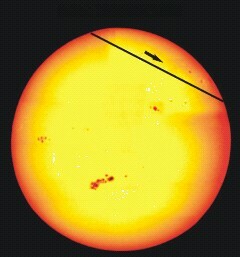 during the observations of the Mercury transit on May 7, 2003 ( PDF or PS ). The transit of Mercury will be visible in the V zone. The Mercury transit on May 7, 2003 will be visible from Europe and Asia in every place where the sun is above the horizon and the sky is clear. 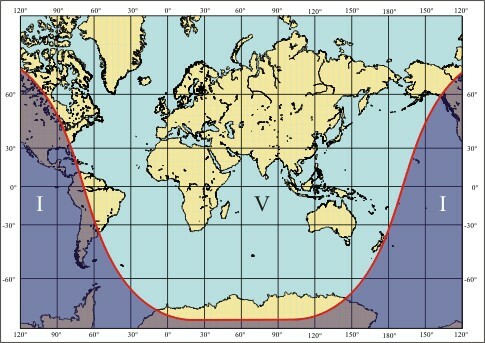 At the beginning of the transit the Sun shines over large areas of Europe, Asia and Australia. At the end, Europe, Africa and the western half of Asia are in sunlight. In America, only the end of the transit is visible. The transit begins at about 07:11 hrs CEST (Central European Summer Time), or 05:11 hrs UT (Universal Time) in the morning and ends at about 12:32 hrs CEST (10:32 UT). It thus lasts more than 5 hours. In the middle of Europe, the position of the Sun at the beginning of the transit is already quite high in the sky, and it is therefore quite easy to follow the progress from there. You will find in the table below the exact, predicted timings for a number of major cities. Note that the indicated time is Universal Time (UT) . You must add two hours to get the corresponding Central European Summer Time (CEST). Path of Mercury on the Sun's disk on May 7, 2003. As the figure above shows, the transit path does not cross the centre of the Sun's disk. To know where it starts, that is, where Mercury first passes the border of the solar disk, think of the Sun's disk as a clock, with 6 o'clock towards the horizon and 12 o'clock pointing upwards from the horizon. Then you may expect to see Mercury at the beginning of the transit event in the direction of about 10 o'clock, in the middle of the event at about 12 o'clock and at the end at about 2 o'clock. It is not easy to see the small disk of Mercury, though it may be more convenient to contact the nearest astronomical observatory, science centre, planetarium or astronomy amateur club, - they may arrange a public observation by means of good amateur or professional telescopes. 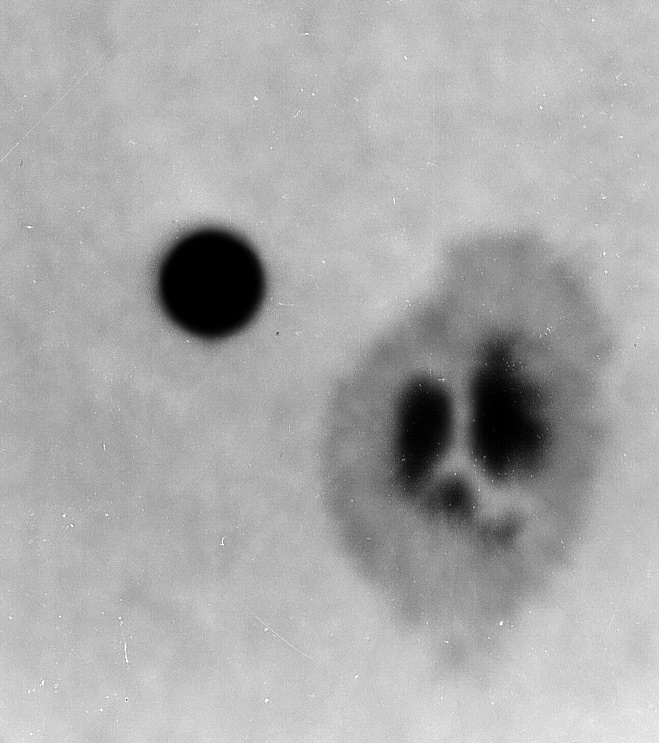 A photo of Mercury's disk, seen on the solar surface near a sunspot group with a professional telescope at the time of the transit on May 9, 1970 (Observatoire de Paris). See the transit on the web! Short notes for students and teachers - a brief introduction for school students and their teachers to the Mercury transit on May 7, 2003. Available in several languages (until now: Chinese, Danish, Dutch, English, French, German, Italian, Portuguese, Romanian, Russian, Swedish, Spanish) and in different formats (Word and HTML). Information about Mercury , the innermost, smallest and hottest planet in the solar system. Information about the Sun , our nearest star. Access to recent solar images (from ground-based telescopes and SOHO), via the dedicated webpage at the Observatoire de Paris. More links can be found on our live links web page. And you will certainly enjoy the 1914 painting by the Italian Futurism painter Giacomo Balla of a Mercury transit, which can be found at the Guggenheim Museum (thanks to Ralf Buelow in Berlin, Germany, for this information).